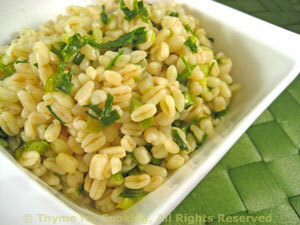 Barley with Green Garlic, Thyme for Cooking spring gourmet side dish. Barley is a hearty, nutritious grain; easy to cook and flavorful. Here we dress it up for spring with fresh chives and green garlic. Trim green garlic and slice, using as much of the green tops as reasonable or trim, slice leek and mince garlic. Sauté green garlic (or leek and garlic) and chives in oil in a small saucepan for 2 minutes. Add stock, barley, cover and simmer until done, stirring occasionally.